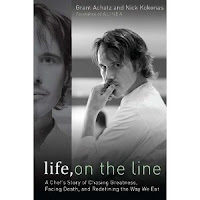 Life, On the Line is not a cookbook, it is the story about a driven chef who began working in his family’s restaurant at the early age of five and rose to worldwide prominence. It is written in two voices, one Chef Grant Achatz of Michelin starred Chicago restaurant Alinea and his partner, Nick Kokonas. Thanks for the tip Dara! I just bought one for Ned, he's going to love it!